Extract of a review by Andrew Longhurst published in SAM 35 Speaks June 2018 When I got the kit, which is of Czechoslovakian manufacture, I spied a reference in tiny writing on the box to its being, “Made according to the 1948 draft” (I presume draft means plan). 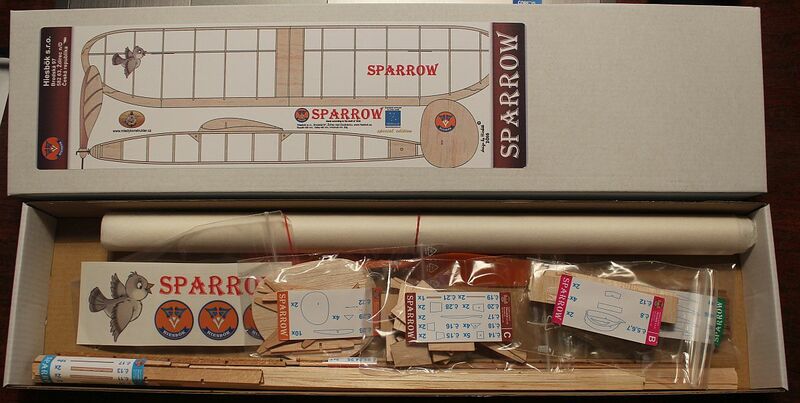 So this kit is based on the famous High Performance Sportster vintage design and it seems a bit strange to change the name to Sparrow. Apparently the reason is that if you call a kit by its original name it just encourages people like me to write in criticising the dihedral keepers as not being authentic or some such pettifoggery. But what a kit it is, I have never seen anything like it. If I told you that even the fuselage struts are laser cut to length you wouldn’t believe me – but they are. Neither are the parts strewn over the bottom of the box, each individual part of the plane has its own little bag of bits. One of the most interesting of those is the bag containing parts for a complex little single blade folding prop, an Igra 8ins plastic prop is also supplied The box contains a very pretty plan and also plenty of assembly photos (with notes in Czech unfortunately). With one exception, the wood was well selected and the spars were all accurately cut to size and notched. The sheet of white tissue is large enough to mess up and still re-cover most of it. All you need is glue and dope. Yes, there is rubber in there. One thing I have never seen before is that the ribs have spacers temporarily attached at the back to get the TE set at the correct angle – amazing! Putting the original plan next to the kit plan a few differences become apparent. The kit fuselage has been made square presumably to minimise the lengths of ready cut struts but the original model was 1/4ins narrower in width than height. The longerons which were originally a fiddly 1/16sq are shown as 2.5mm, which is sensible, but the wood in the kit was actually 3mm (1/8ins). The kit provides a pair of sheet wing mounts which are neat but the opportunity to provide positive incidence has not been taken. So, like the original, it is likely to take the air rather nose heavy. Turning to the wing, the 1948 original had no extra strengthening on the central bays but the kit provides two extra ribs and sheeting between these and the centre. The excessive dihedral on the original has also been reduced to a sensible amount. Building The longerons were of superb wood but being over-thick weighed 3.6g so I planed them down a bit. All but one of the laser cut struts fitted perfectly on both sides. Strangely, the one left over reminded me of the time I first dismantled and rebuilt a Mini Cooper engine and at the end had one lonely nut sitting in the tray looking at me accusingly. I never found out where it went and the motor went racing without it! Anyway, I decided to slim the fuselage to the original HPS width although no-one would object if you left it wider. The wing sunk me however. All the wood in this kit is good straight grained stuff, most of it a bit on the hard side but the LE was rather soft. Consequently, it snapped when trying to bend it round the tip. It might have worked if I had steamed it first. Eventually I carved two bits of 1/8 sheet to the correct shape. The problem wouldn’t have arisen had the kit people not changed the original tip design. I gather this detail will be revised in the latest kits. I decided not to use the tissue provided, firstly because it is 50% thicker than Esaki LiteFlite and secondly because it has poor wet strength so it is best attached using Acetate Dope which I no longer use. Fettling up the model I discovered that the wire provided for the prop shaft fitted the bearing but was too small for the prop which has a larger hole. This was a nuisance as I had to root about for the right size wire for the prop and then drill a bigger hole in the plastic bearing. In hindsight I should have drilled and sleeved the prop instead as it would have been lighter and the larger wire impaired the operation of the ramp style freewheel. This eventually compelled me to retro fit a smaller shaft. The structural weight was 35.5g including a Tommy timer (4g) but I shaved off, or didn’t fit at least 5 grams of wood supplied in the kit. For comparison my P20 weighs 30g so I think the kit weight is pretty good considering the less efficient structure. Flying Using the Igra plastic prop I soon had it flying well. It doesn’t need more than 5.5g of rubber provided in the kit to obtain a sparkling performance. With the CG shown on the plan, about 60%, The additional 3/32 (2mm) of extra incidence I built in for the tailplane proved just right. Several flights of well over a minute were obtained going right/left which is unusual for a freewheeler. I was pleased with this as the glide was poor owing to freewheel not working (see above) and it still being slightly nose heavy. Having sorted the freewheel and with 10gms of Super Sport aboard, I found that flights of 1:30 or so were a regularity from this great little thoroughbred. The DT was needed every flight! . This page was printed from www.densmodelsupplies.co.uk on Tuesday 23rd April 2019 at 12:21 am. To see this page in it's original context, please visit www.densmodelsupplies.co.uk/digest.php.